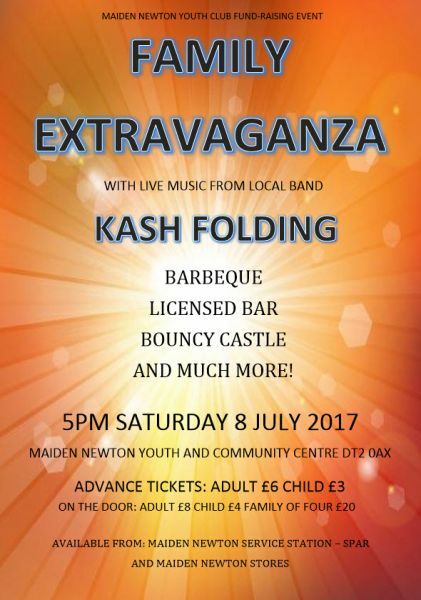 MNYC are holding a Family Extravaganza starting from 5pm on Saturday 8th July 2017, there will be a barbeque, licensed bar, bouncy castle, live music from local band "Kash Folding" and other awesome attractions. It will be held at Maiden Newton Youth and Community Centre DT2 0AX. Advance tickets: Adult £6 Child £3 On the door: Adult £8 Child £4 Family of four £20 and are available from Maiden Newton service station-Spar and Maiden Newton Stores.